Hola! We are very excited to bring you the first of our cooking classes… first off the bat for my birthday dinner tonight is… PAELLA! 1. Dice tomatoes and onions into fairly sizeable chunks and toss into frypan with loads of olive oil and crushed garlic. Add saffron. Allow to simmer for 45 mins until it becomes a mushy mixture, stirring frequently to stop it “catching” on the bottom of the pan. 2. Make fish stock while waiting for tomato/onion mix. Add all gizzards from cleaned seafood, 2 vegetable stock cubes, and enough pints of water to cover the rice (Say 4 pints). Allow to boil until stock is nice and fishy. Place to side. 3. Par-cook chicken and pork pieces in frypan until 80% cooked. Set aside. 4. Cut up and clean octopus and fry quickly until just soft. Set aside. 5. Cut up monkfish and set aside for later use (do not cook yet). 6. Clean prawns, removing head, tail and legs to include in paella however keep a good handful aside intact for later decoration on paella. Cook the remainder to include in paella. 7. Clean and boil mussels until they open… and then a little longer. 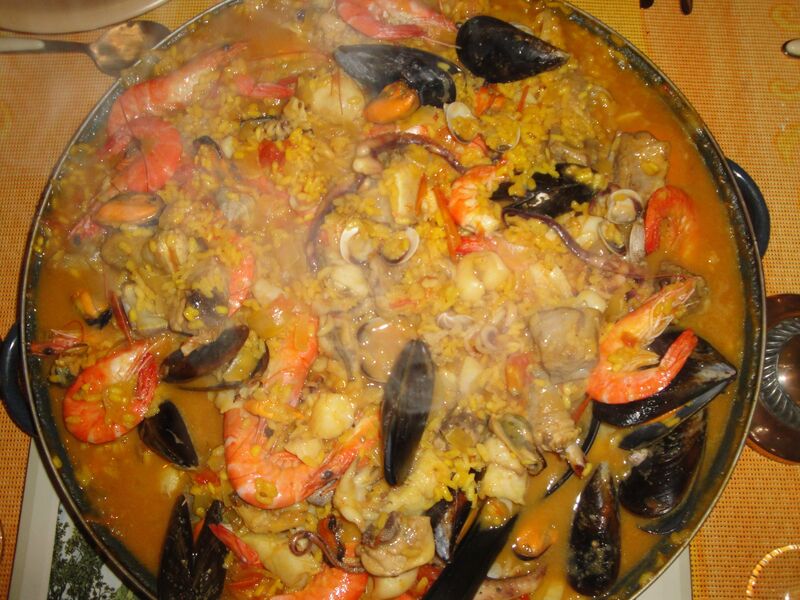 Remove some from shells to include in paella, and also keep some intact with shell for decoration on paella. 8. When your guests have arrived and you’re about ready to eat, whack it all in a pan, give it a good cook for 15-20 mins and bon appetite!